I was supposed to give a shortened version of ‘Little boys and blue skies‘ at the AAG Annual Meeting in San Francisco (about drones and atomic war: available under the DOWNLOADS tab) and fully intended to do so. 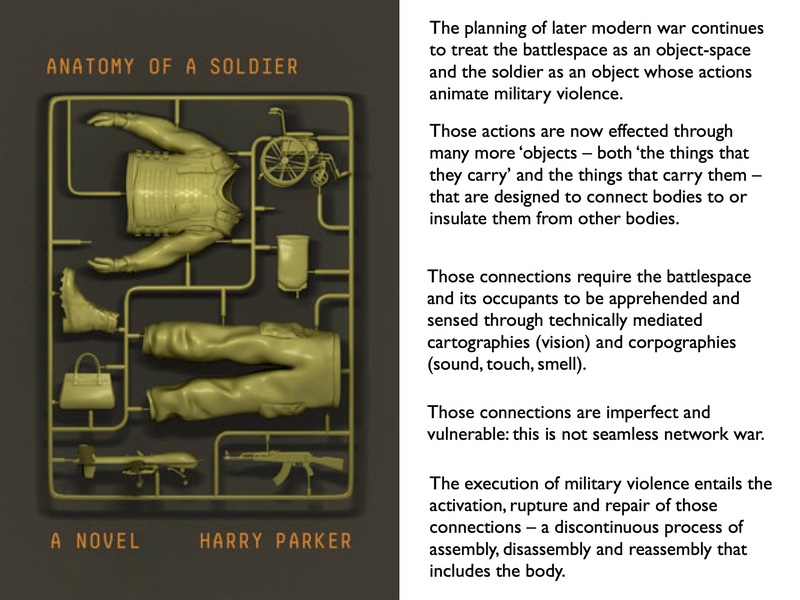 But in the event – and as I implied in a previous post – I decided to talk instead about Harry Parker‘s Anatomy of a soldier. It was a spur of the moment decision, though it had been pricking away in my mind ever since I read the novel, and I only decided to do it at 10.30 the night before: madness. But it was much closer to the theme of the sessions organised by Kate Kindervater and Ian Shaw on ‘Objects of Security and War: Material Approaches to Violence and Conflict‘ than my original presentation would have been. I’ve added the presentation to those available under the DOWNLOADS tab (scroll right down). I hope that most of it will be self-explanatory, but some notes might help. I started out by invoking Tim O’Brien‘s twin accounts of the Vietnam War, The things they carried and If I should die in a combat zone, which provide vivid reminders of the weight – physical and emotional – borne by ground troops and the toll they impose on the soldier’s body. I talked about this in ‘The natures of war‘ (also under the DOWNLOADS tab) and – following in the footsteps of that essay – I sketched a brief history of the objects soldiers carried in to the killing fields: from the Somme in 1916 through Arnhem in 1944 to Helmand in Afghanistan in 2014 [shown below]. 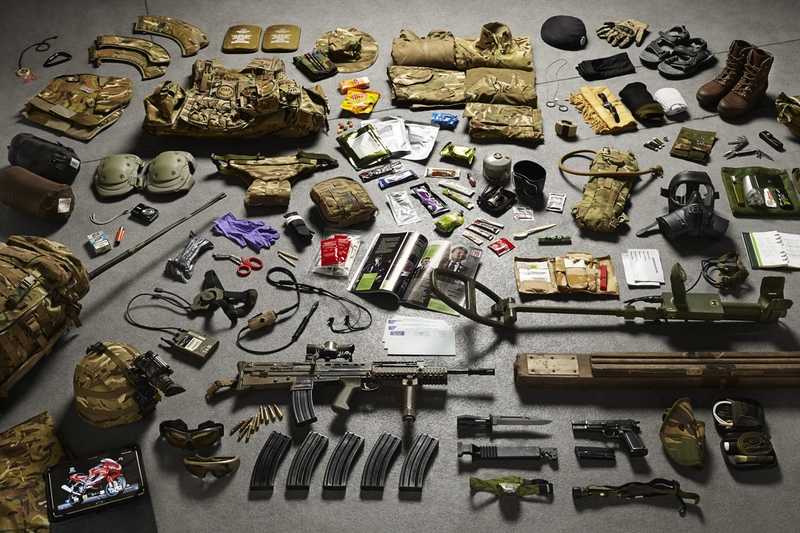 My source for these images was photographer Thom Atkinson‘s portfolio of Soldiers’ Inventories. But I was more interested now in the objects that carried the soldiers, so to speak, which is why I turned to Anatomy of a soldier. In order to throw the novel into even sharper relief, I outlined some of the other ways in which IED blasts in Afghanistan have been narrated. 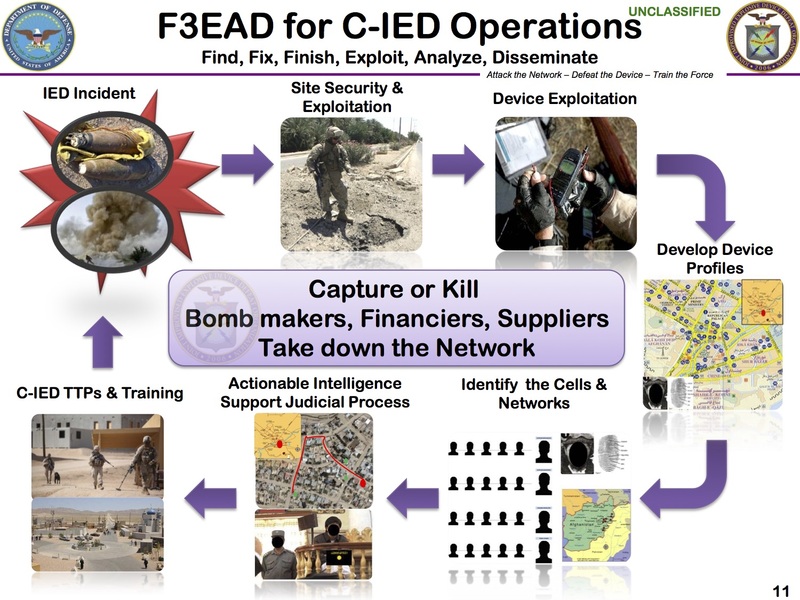 These ranged from the US Army’s own schematics [the image below is taken from a presentation by Captain Frederick Gaghan here] to Brian Castner’s truly brilliant non-fiction All the ways we kill and die, in which he describes his investigation into the death of his friend Matt Schwartz from an IED blast in Helmand in January 2012. (This book has taught me more about the war in Afghanistan than anything – I mean anything – I’ve ever read). 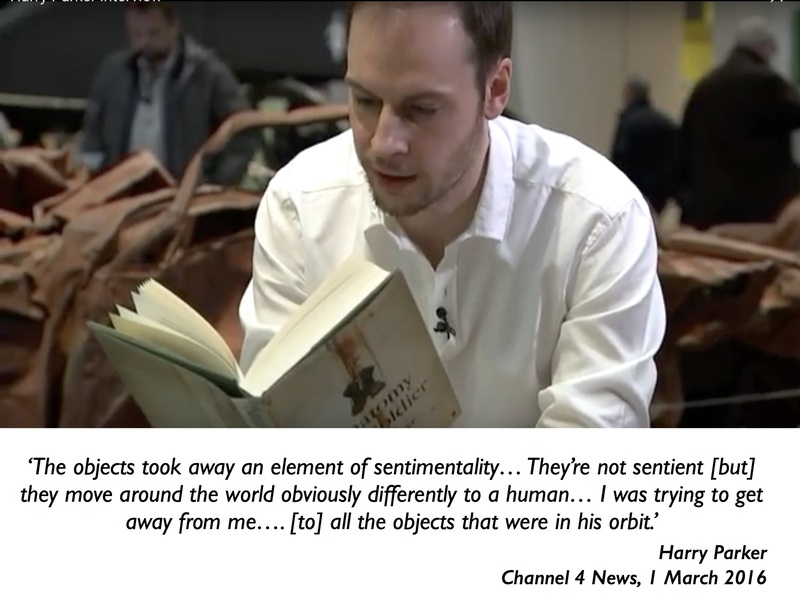 All of this prepared the ground for Parker’s novel which tells the story of a young British officer in Helmand, Tom Barnes, who loses his legs to an IED blast – told in 45 short chapters by the different objects involved. Not all of the chapters are wholly successful, but many of them are utterly compelling and immensely affecting. 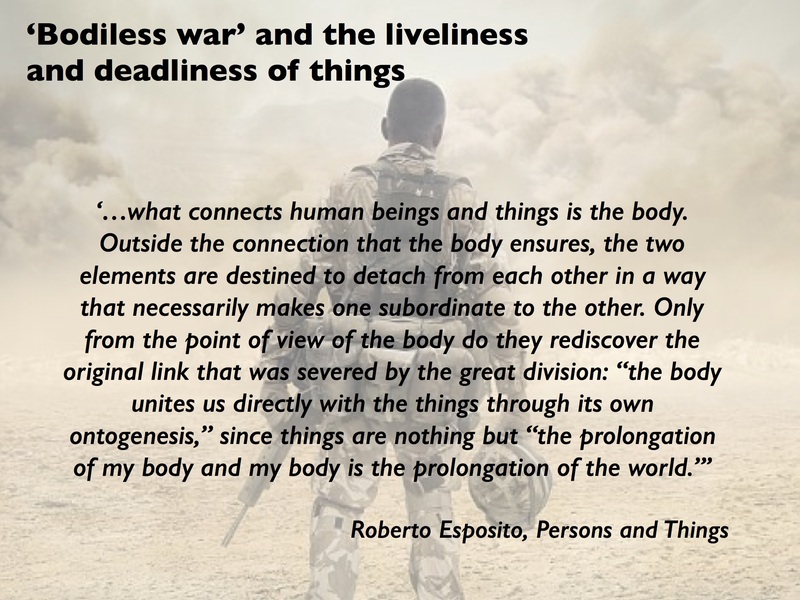 The overall effect is to emphasize at once the corporeality of war – ‘virtually every object-fragment that is proximate to Barnes is impregnated with his body: its feel – its very fleshiness – its sweat, its smell, its touch’ – and the object-ness of military violence. I juxtaposed the novel to Parker’s own story – he too lost his legs to an IED in Afghanistan in July 2009. Yet he constantly emphasises that he never wanted the novel to be about him. 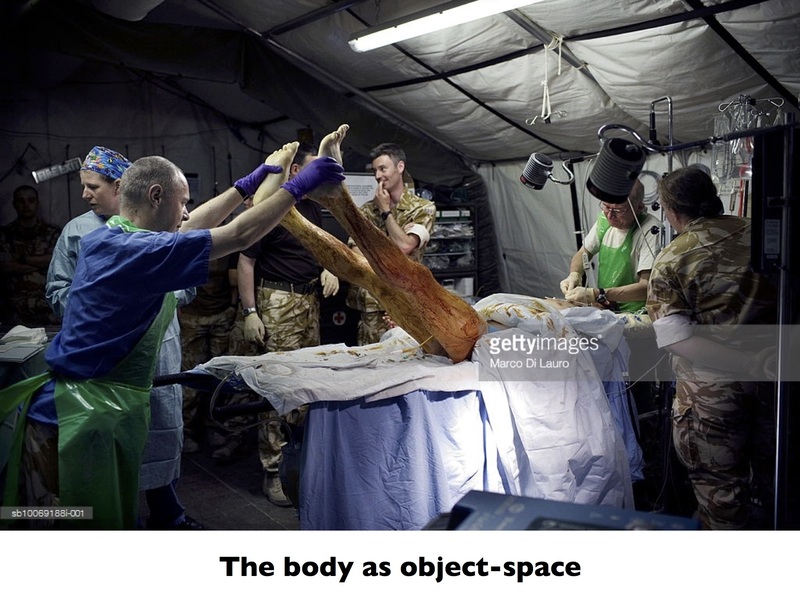 This entry was posted in Afghanistan, biopolitics, books, casualties, corpography, late modern war, United Kingdom, USA, Vietnam and tagged Afghanistan, Anatomy of a soldier, bodiless war, Brian Castner, corporeality, Harry Parker, IED, Roberto Esposito by Derek Gregory. Bookmark the permalink.